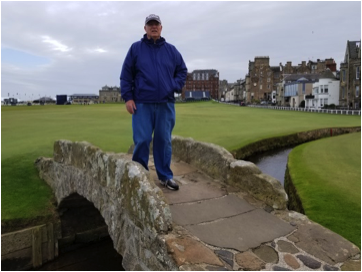 As many of you know, I have been selling Golf Vacations for over 20 years, and one of my best sellers is Scotland. However until recently, I had not been there. We just completed a fantastic tour of Scotland and Ireland with Collette Vacations. Although I did not play golf there because it was a tour, I did get to see first- hand what golf was like in this beautiful country. I wanted to share this new found knowledge with you, so that you can plan your ideal Golf Vacation there too. While many American golf fans will tune in to watch the British Open some may still hesitate at trying their hand at Scottish links golf. Wind, rain and blind holes are, literally, par for the course in the game’s homeland. On a tour of Scotland’s best golf courses, what’s your first stop? St. Andrews on the east coast, because the Old Course is where it all began — links golf — though people wouldn’t hold it as the very best-condition golf course. Kingsbarns would be another great links golf experience within the city of St. Andrews, right by the North Sea. That’s very much part of the links playing experience, the sea. If the wind is blowing from the east, you’re getting the wind from Scandinavia and Russia. It can be bitterly cold, and the driving rain can really make the golf more challenging. Some days you get no wind, and it’s a totally different game. Another feature of the St Andrews area is that there are seven courses on the property, so multiple rounds can be played while staying in the same Hotel. Two of my favorites are Rusacks, and the Old Course Hotel. You can walk onto the Old Course daily, and the greens fees are reasonable. No carts or “buggies” are allowed, and caddies are highly recommended. You can also enter the lottery for tee times a year in advance, and then plan your entire Vacation around that time you are awarded. Head inland and stop at Gleneagles. One can play any of our courses: the P.G.A. course designed by Jack Nicklaus or the King’s and the Queen’s courses, which date before the hotel opened in 1924. 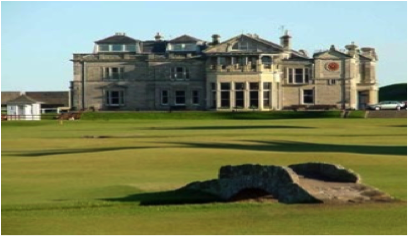 There is lots to do besides golf: the spa, the Michelin-starred Andrew Fairlie restaurant, tennis and whisky tours. Then go southwest to Turnberry on the Atlantic. It has an excellent hotel, and the Ailsa course is fantastic. You can see the ruins of the Scottish king Robert the Bruce’s castle from the ninth hole. Around there are a whole host of hidden gems like the Prestwick and the Royal Troon, and that’s what you really want to get to in Scotland. And if you were to go north? The Royal Aberdeen is a good golf course by the sea. If you’re in Aberdeen, you’ll want to be staying at a hotel called the Marcliffe. They’re well – tuned up to everything there. Nairn, that’s farther north. Farther still is Royal Dornoch. Tom Watson said that it’s one of his favorite golf courses. How difficult is it to get on these courses? A lot of these smaller member’s courses like Muirfield, where the British Open is held; Prestwick and Royal Troon; have been around for hundreds of years. They’re run by the members for the members; consequently it’s not as straightforward as getting your credit card. But you can get on these courses on certain days and times. Ring them up or check their web sites to find out which days are open to visitors. Or hook up with larger resorts because the pro will know the places that one can and can’t get on. Or find a good travel adviser like Golf Exclusives. Editor: Send me your questions about Golf in Scotland. I will get back to you promptly.